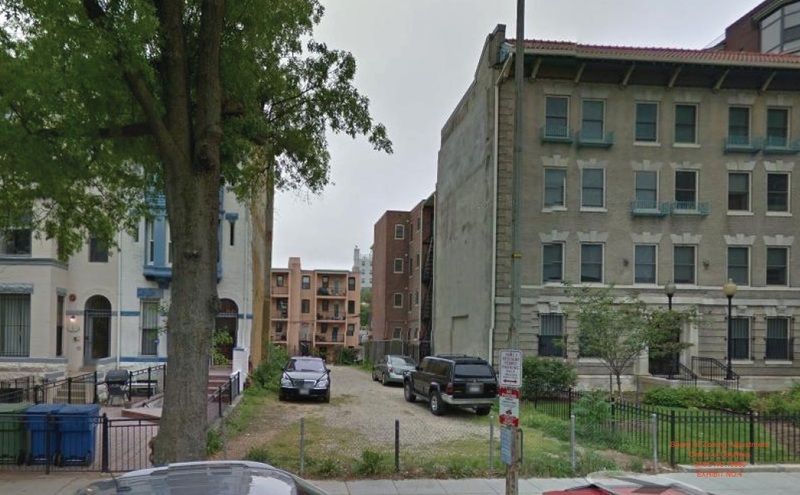 More Housing Planned in Columbia Heights | Park View, D.C. Empty lot at 1368 & 1370 Kenyon Street, NW. According to a Board of Zoning Adjustment application (#18880) filed on September 15th, a new five story, 8 unit multi-family development is being planned for the vacant lot at 1368 & 1370 Kenyon Street, NW. While there are several variances being requested according to the application, the chief issue appears to be that these two lots originally contained row houses — long gone — and they are zoned accordingly as R-4. As the lot is currently vacant, there is no building to convert to an apartment dwelling. In looking over the property, and considering that it both abuts an apartment building and is across the street from apartment buildings, I believe that the proposed building is the highest and best use of the property. I’ll post more about this proposal as it becomes available. This entry was posted on September 30, 2014 at 7:01 am and is filed under Architecture, Development, Housing. You can subscribe via RSS 2.0 feed to this post's comments.